In Punjab, apart from Sikhism, the history of Punjab has Sufism playing a very important role. The western part of Punjab is majorly influenced by Sufi Saints and Sufi Pirs. With time the trend of Sufi singing has certainly increased as people have started to like it but still, the condition of the artists remain the same. The shrines in this region of Punjab is called as ‘low’ caste Dalits. Since then the Dalit community takes care of the Sufi shrines. Ali is a Punjabi Sufi singer and has a versatile group of people who are very talented. Ali himself is a music teacher and Head of Department in Patiala University, Punjab. Ali wants to spend all his life singing the Sufi songs and making people hear them. He and his group want to surrender themselves to the one Almighty and wish to stay like that always. He loves to sing Qawaali of Abida, the song of Nusrat Fateh Ali, Ghulam Ali, etc. Sufism spreads the message of spiritual harmony in society and there can be no other better medium than music to carry forward this philosophy. 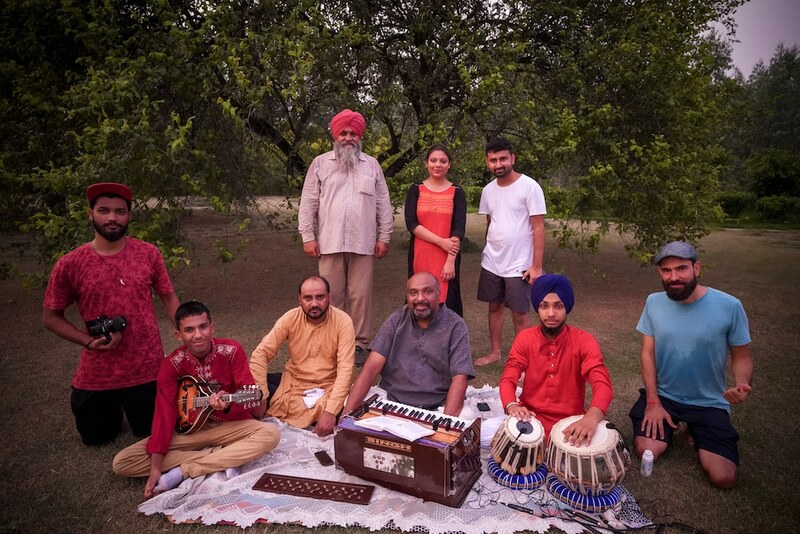 Ali and his group love to sing songs inspired by the works of legendary Sufi poets like Bulle Shah, Mirza Ghalib, Rumi, Kabir and Faiz Ahmed Faiz. Sufi has different forms like Qawwali, Kafi and Ghazal. Sharan and his team are from Laputhana, Ranchi, who at present lives in Pavatoli, Ranchi. The group leader, Sri Sharan is not just an artist but also has many feathers in his cap. He was an accountant in AG office and is also a Lawyer. Upon asking his relation and connection with music he gives the credit to his family and his upbringing in during his childhood. They perform a folk tradition called Urao which is one of the most famous in the state of Jharkhand. 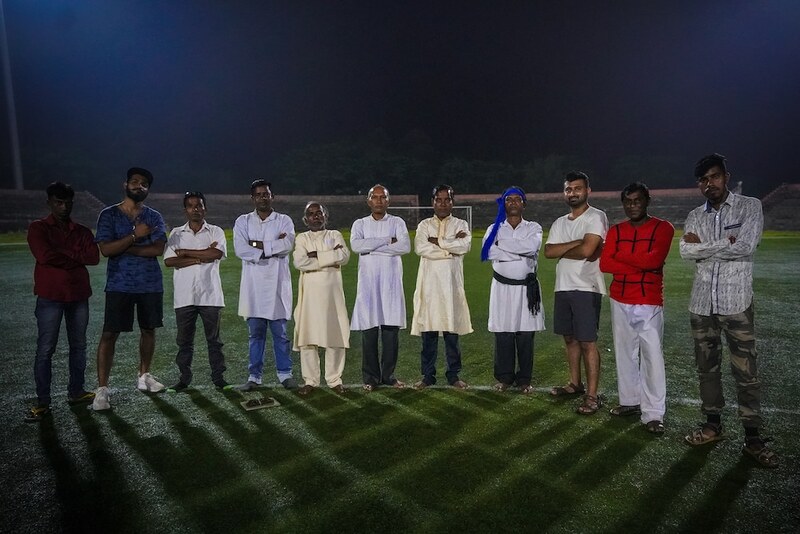 The group has won various accomplishments like a Gold Medal in Hyderabad. They have also performed in Maharashtra, Kolkata, Delhi etc. and have won many applause. They were also been honoured by the state government for their contribution to the art and culture of Jharkhand. Lok Seva Samiti gave him Jharkhand Ratan Award, Vishv Seva Samiti, Delhi – National Award. One after seeing the sincerity and dedication towards the intricates of the performance that hey gave us we could easily guess that for the music has always been there as a learning and motivation and passion. He recalls of going to Akhada to sing and dance, but all of this was considered very demeaning by the artists. It was Sharan’s father who told him that once gone is lost forever so leave everything and pursue music. About the folk Sharan tells that all the 12 months have different songs, the folk culture so rich. He also makes sure that if not written the song will be lost forever and thus he maintain books of these songs by publishing them. That is his way of documenting the songs. We feel that Anahad needs more people like him to do come up themselves and do their bit, as the future generation is not using this language so it has to be preserved somehow. With the conversation going on with we reached the location which was decided by the team and it was right in front of the hill where they reside, making the set and the video look incredible. The entire team is very hard working and full of life. They believe in the policy of doing good, be good. People ignore the local music of particular region by saying that it has rusted, but hardly they realize that it is as much as a part of our valuable tradition. If only people would have thought so the music would have had evolved so much today. Kurmali language is spoken in the Chota Nagpur region of Jharkhand. It is usually associated with the Kudumi Mahato community of Jharkhand. Kurmali is spoken in other regions of Jharkhand and West Bengal. It is claimed that it is the nearest language to Charyapada. It’s dialect how so ever is very much like Panchparganiya. Also Kurmali is the native language for the community of Kurmi, a caste. There are various alternative names for the language which is Bedia (from the Bedia caste), Dharua, Khotta, Pan Sawasi, Tanti, Tair, and Chik Barack. All the folk traditions in this community are followed in this language only. 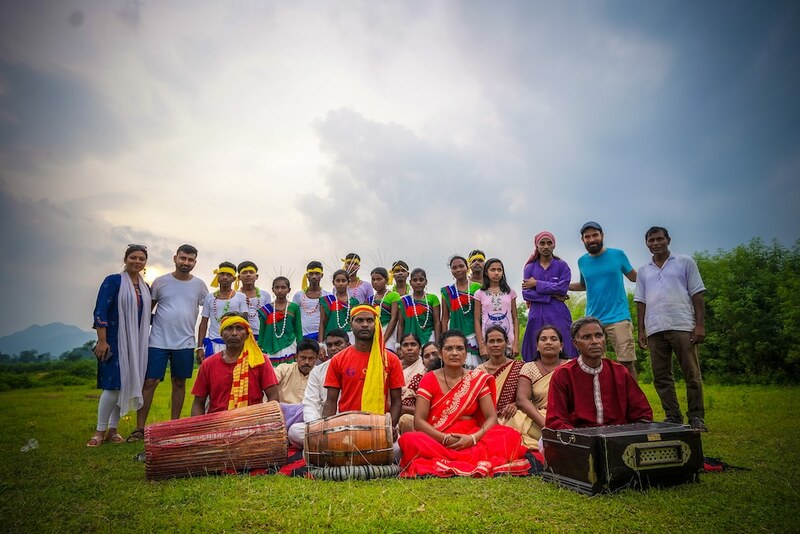 The songs are written, composed and performed in the traditional language only, which is Kurmali. The group has dance members who give a beautiful coordinated performance with the traditional songs sung by the group. Their every performance leaves everyone mesmerized whenever they perform. The group has wonderful versatile members for whom music is passion and they shall follow it to their grave. They all belong from a small village in the district of Silli near Ranchi, Jharkhand. Srishti Dhar Mahato is a very talented artist and a very learned individual. He is an expert in the Kurmali folk music because of his extensive vast knowledge about the Kurmali language. Mahato is a farmer also but with that too he carries his passion for music alive for the sake of his culture and his love for music. He has been learning music since he was just 5 years old then. Since a very tender age, he has been following and leaning music stealthily. The group has been performing for a long time together now. They all have been learning and the following music from their childhood. They are extraordinary artists who put in efforts at every performance like it is their last. 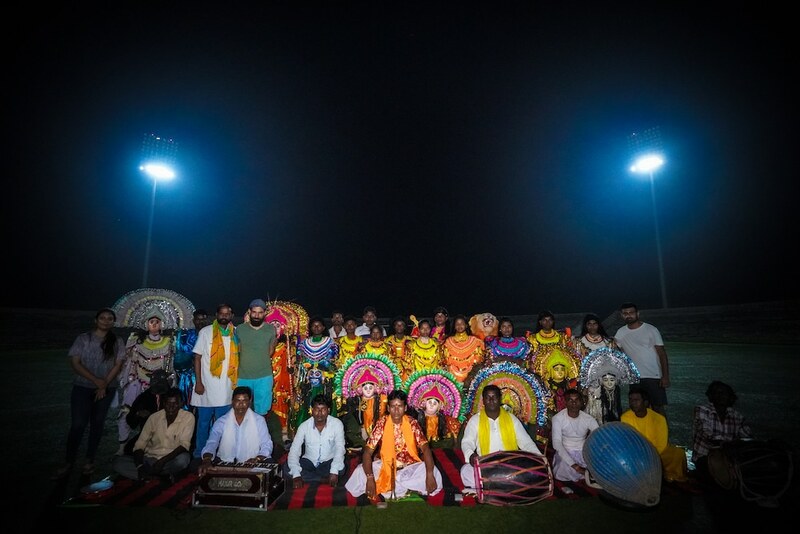 They have performed almost everywhere in their region but together as a group they had never represented their tradition and culture on the national or international platform. They all wish to travel the globe and spread the message that their beautiful heritage songs have to give. 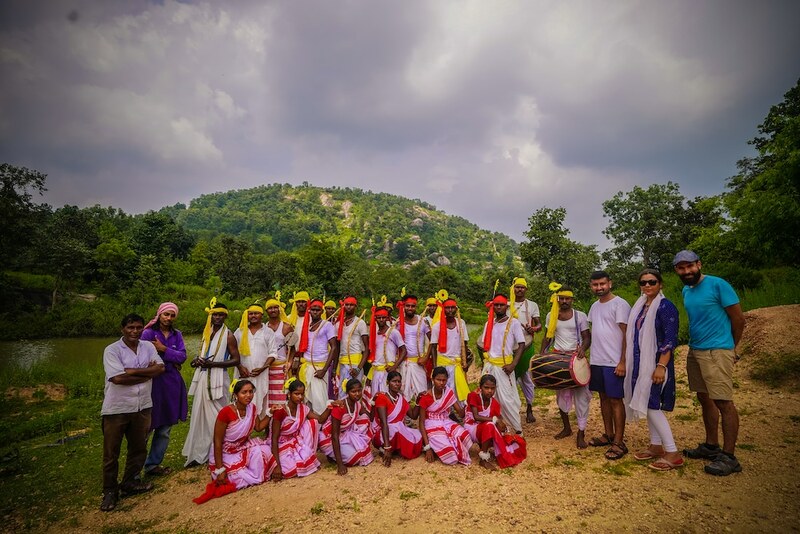 Chota Nagpuri is one of the oldest musical and dance form of Jharkhand since Jharkhand was also known as Chotanagpur. Nagpuri is mostly famous in Ranchi region. Nagpuri is also a language and has related music, folk songs and dance form. In this category also, the group would perform both music and dance. Sulekha and Arun are leaders for this group who sing in Chota Nagpuri language. She sings in Chota Nagpuri language which is one of the many dialects spoken in Jharkhand. Chota Nagpuri is mainly spoken in Ranchi and is said to be a sweet language that depicts love and kindness. The songs too thus sound very sweet and melodious. Her songs have been recorded once in a studio in Delhi which she did voluntarily for her Guru Prem Rawat ji. Audios and Videos of the song are played in the region, though no one knows that they were composed and sung by her. their team has been invited to perform in many cities in Jharkhand and also Delhi. They are regular TV and Radio artists though do not realize that the flavours of their unique local music can easily create waves internationally. The group is very fond of singing religious songs and love to listen to them too. Arun and Sulekha both write also their own songs and compose them later. The group is very well coordinated as they have very well arrangement of the songs and their selection of people is also very well defined as per their role in the song. Like all the other dances of Jharkhand, the folk dance that goes with Chota Nagpuri is also very primitive in nature. It is very traditional in taste and is inherited by tribal people from centuries who treat them as heritage. They have been passing on this tradition from one generation to another since ages. The dances are of various types in tempo they are slow dances and very fast dances also. The dance style is a mixture of slow and fast dance. It is largely presented in the Nagpuri movies also. Mundari people are a tribal group of India residing in Jharkhand. They speak the Mundari language, which belongs to the Munda. They are India’s one of the largest scheduled tribes and are called with different names at a different region where they are found which is not specific to Jharkhand. They are well known for preserving their culture. The group leader of Mundari group Panchanan Munda told us that they have a treasure of so many folk songs, dances and various musical instruments. The community makes no discrimination between males and females and thus both of them participate with excitement at the dance event held at social platforms and events. sexes participate in dances at social events and festivals. Upon learning we got to know that they follow elaborate rituals in order to celebrate the festivals and occasions like birth, death, weddings, etc. Panchanan explained to us various form of celebrations like the birth of a boy is celebrated as an earner of the family, the engagement ceremony is called lota pani, the girl’s birth is celebrated as a family caretaker. They have their own set of social traditions and regulations which is followed in their entire society. They are known for following it in any circumstance what so ever. They never go back on their norms and celebrate and live a very happy life. Mundari songs are about the bravery also that their people show during the time of the revolt for the independence. With all this conversation about the rich folk, we reached our location which was a bank of a huge pond surrounded with green mountains. The groups were dressed in bright colour clothes with a typical set of accessories on them. The group consisted of both men and women who participated in dancing along with the singing. The steps were well choreographed and coordinated by Panchanan himself resultant a beautiful performance which we thoroughly enjoyed. Far away there is a land where lives a group of people who travel from one place to another singing songs and dancing. The group practices the traditional Jhumar folk which is widely sung in the harvest season and people dance on this. The harvest season is usually accompanied with the monsoon season i.e. from August to September. It majorly describes the happy and joyous lives of the tribal folk of that region. Typically the people who dance are male dancers. The style and get up of the entire set up is always so beautiful that one feels it is a treat for the eyes. The signature step of the dance is the round movements of the of the dancers made with a musical instrument – drum being the centre of it. And besides this, the singers sing the songs while the dance is on. 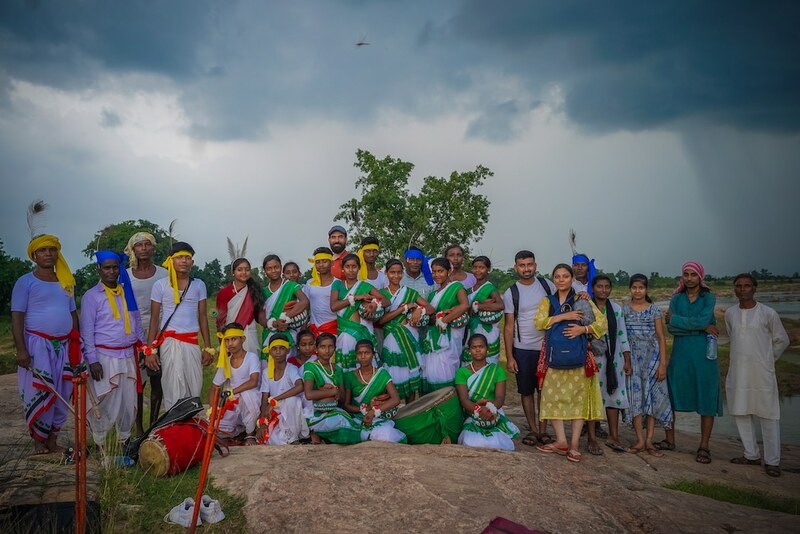 Upon asking about the Chhau, Sunil explains that Manbhum Chau is a martial art dance performed by all communities of Jharkhand where the group of dance use heavy masks and brightly coloured costumes and traditional ornaments to give an attractive look. The mask is used for the description of the character. What is typical of this dance form is that there are hardly any words spoken and the entire story is performed with the help of body actions and movements. Be it Veer Ras or Karun Ras, the dancer depicts them only through his actions. The dance form can also be called a martial art because of the extreme movements like Ucchlan (jumping), Baaji (springing) etc. Sunil Kumar Singh is the Chief Trainer at State Manbhum Chhau Dance Artistic Centre in Jharkhand. It is a training and research centre with musicians and dancers from across the country and the world coming to understand the nuances of Chau dance. Apart from Manbhum Chhau, they can also learn about other traditional dance forms of Jharkhand like Paika, Jhoomar, Damkach, Karma, Sarahul etc. Although Chhau doesn’t need an introduction for the one world who don’t know what it is, they should get to know about it. Sunil Kumar Singh manages all the artists and their performance with his double doctorate degree on Chhau. He is a very knowable man and believes in imparting the same to different people. Traditionally, Manbhum Chhau began in Jharkhand during Chait Sankranti (13 or 14 April as per lunar calendar) and went on till the beginning of monsoons. This was the period when farmers were a little relaxed and spent their time dancing and listening to stories of Ramayana. Manbhum Chhau in its original form is Shiv Upasana (Worshipping Lord Shiva). However nowadays it is performed around the year and the stories revolve around social issues, government schemes or other good causes to motivate people in villages. The masks are an important part of the Manbhum Chhau dance form. They are big in size, very colourful and depict characters of the story. Although they look heavy, they are light and handmade. Artists themselves make these masks out of paper mache, clay and cotton cloth. Each made in the layer and it may take from 15 to 30 day to make one. Chhau dance has been recognized by UNESCO as an intangible international heritage. It is believed that the dance form began in Jharkhand hundreds of years ago, and is now popular in Odisha and West Bengal too. Depending on the area, the dance form has ‘gharanas’ or specialist schools or methods. Some popular types of Chhau dance are Manbhum Chhau (with big masks), Saraikela Chhau (smaller masks), Kharsawan Chhau and Khunti Chau all from Jharkhand. Mayurbhanj Chhau of Odisha and Purliya Chhau of West Bengal are also other forms. 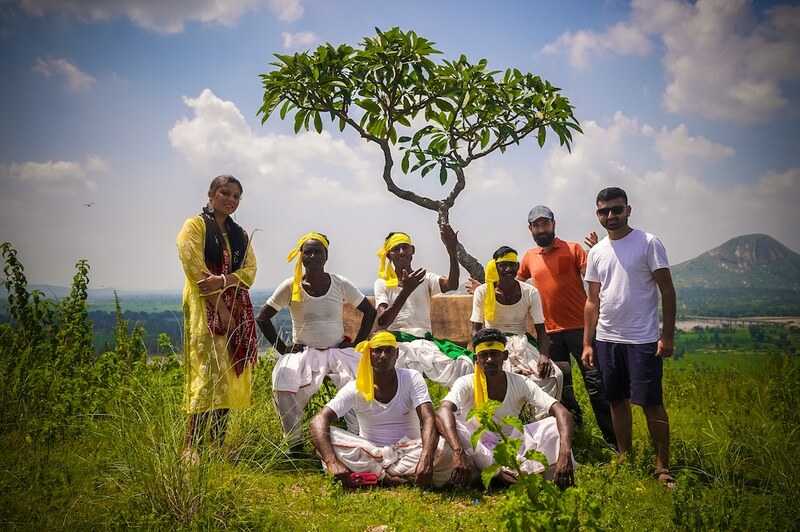 Upon the small hill of Silli in Ranchi, we reached with our team and equipment only to witness one of the most beautiful traditional folk Tussu performed by a talented group – Ashar Queri and others. They were dressed up in a simple vest with dhotis and colourful ribbons tied to him around his head, wrist, legs and instruments. We did the setup upon reaching on top of the hill with our wireless equipment getting ready to hear beautiful songs from them. While the set up was on the way to be put up in order, Ashar Queri told us that he is from a small village called Hajam in Jharkhand. His family as he recalls with pride has been known as farmers and singers for generations. He said he has been earning his living through farming, and experiencing the joy of life through music. Ashar learnt to sing from his father and grandfather who encouraged him to become part of a group and sing the vanishing village folk songs. Now his son too sings like his father. The entire group consists of simple down to earth people who live their life with full joy and music accompanying them at every step of their lives. The entire group was surprised to see the variety of equipment were quietly excited to know that they would be using them. We asked Ashar if he had ever heard his songs himself, it was a no in the answer. So we made him listen to his track and so until team Anahad recorded his songs he had never head himself. It was the very first time he heard his own voice in 50 years – a moment he will cherish forever. He hopes the dying village songs can reach more people and the modern generation understands their value. He sings for his own happiness but also believes that he would be happier to share his stories, the songs he sings, the song of Tussu from a small district called Sili in Jharkhand be heard around the world.